Sally Hansen and Nicole by OPI giveaway! Just the week before I flew off to London, I was very much blessed to be invited by Manoah to Sally Hansen and Nicole by OPI’s nail workshop. Now I’ve always had a thing for nail polishes, Nicole by OPI has always been one of my fav and Sally Hansen is just old classic good ol nail polish that can never fail you. With their new collection, Nate has been trying very hard to avoid me going to Watson purchasing the items! 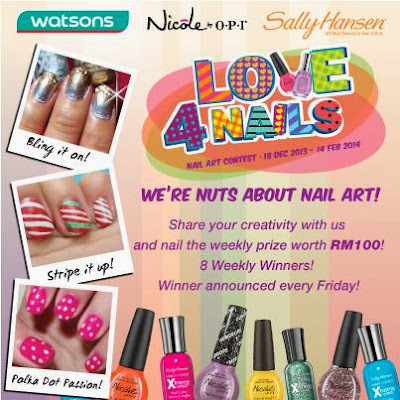 Yes, you can purchase Nicole by OPI nail polishes and Sally Hansen’s nail polish at RM29.90 from Watson(awesome stuff). their most popular item would have to be their Hard as Nail nail strengthener! I’m sure many suffer from brittle nails so this baby def would come really hand! Then Nicole by OPI is slightly newer of a brand, but nonetheless equally awesome( click on the link that will lead you to the main website) and my personal fav brand when it comes to applying the nail polish because they have this awesome awesome brush that fans out to make the “perfect 3 strokes” possible. Also, if you are a fan of textured nail polish, you should totally check their new Gumdrops collection out! They have this sandlike texture upon drying and they last relatively long on the nails! So far they are less prone to chipping and that’s always a very important thing when it comes to good nail polish. Anyways, I am going to focus on their recently launched Selena Gomez collection because I’m really really REALLY this close to purchasing the entire collection for myself! Here are my personal favs! – I don’t know how to apply it! – It’s too difficult to apply lah! Theme: Sparkle your way to 2014! 2)Focusing the glitter polish just at the start of your nails to create the reverse french manicure effect. If the nails still look a lil plain to you apply the Spark in the Dark over it! And that’s how you get a sparkly new years new art without any tools/fancy techniques! Of course if you need any other inspiration or if you have time you can always refer to this set of Nails I had for myself the past few weeks. Again, no tools needed! Inner Sparkle as base coat, Spark in the Dark as Top coat. Sweet Dreams as base, Spark in the Dark as Top Coat. Xtreme Nail Polish by Sally Hansen (blue color base), Gum Drop-My Cherry Amour(the triangular bit), Spark in the Dark as top coat. Anyways I have good news! Sally Hansen and Nicole by OPI is having a giveaway together with Watson! and for reading this far in my blogpost, I’m rewarding you guys with a GIVEAWAY! I’m giving out 2 Bottles each to 2 readers ( Inner Sparkle by Nicole by OPI and Spark in the Dark by Sally Hansen) courtesy to Manoah and Nicole by OPI and Sally Hansen! Contest will end on the 2nd of January 2014 9PM and I will be announcing the winners via email so keep and eye out for your inboxes to see if you’ve won! Think that’s all for now! I better go off to bed now because I have to be up in 5 hours time to catch my train to Paris! Previous Post London so far!